The Gerald R. Ford Presidential Foundation Annual Dinner was held at the Capitol Hill Club on June 4, 2018 in Washington, D.C. The Annual Dinner brought together Ford Family members, Foundation Trustees, Ford Administration Alumni and ‘Friends of Ford’ from throughout the country. 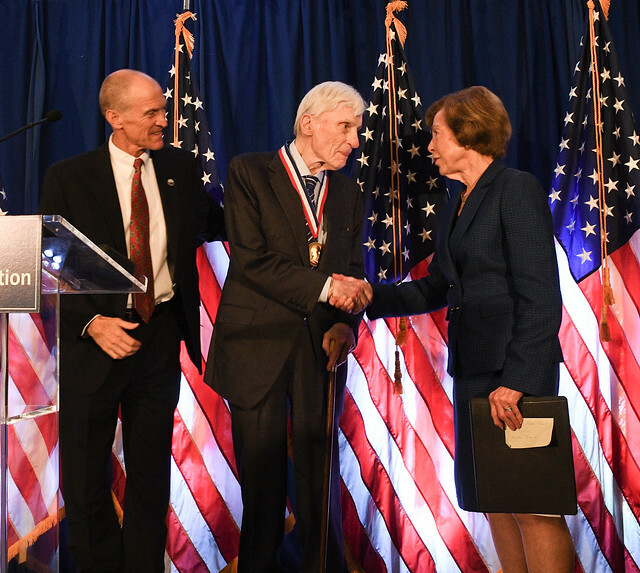 The Foundation presented Senator John Warner with the 2018 Gerald R. Ford Medal for Distinguished Public Service. Carla A. Hills, Mike Ford, and Steve Ford presented the Public Service Medal. Hills recognized Senator Warner’s lifelong commitment to public service throughout his career which included service in the U.S. Navy during World War II, the U.S. Marine Corps during the Korea War, Undersecretary of the U.S. Navy, 61st U.S. Secretary of the Navy, and U.S. Senator from Virginia. Senator Warner was sworn in by Vice President Gerald R. Ford to be the Director of the American Bicentennial Administration on April 11, 1974 and joined President Ford on the flight deck of the USS Forrestal to initiate the ringing of the Bicentennial Bells across the nation on July 4, 1976. While still in office, Senator Warner, in his capacity as Chairman of the Senate Armed Forces Committee of the United States, introduced an Amendment to Senate Bill 2776 that was presented to the United States Senate on June 13, 2006, to name our nation’s newest nuclear-powered aircraft carrier, the USS Gerald R. Ford (CVN-78). During his remarks, Senator Warner highlighted the importance of Gerald R. Ford’s legacy and the pivotal role Ford played in his political career. Warner recalled their friendship began in 1960, when Warner was a member of Richard Nixon’s Presidential campaign. Warner was coordinating a train tour through Michigan when he met Congressman Jerry Ford. Additionally, Trustee Carla A. Hills presented the 31st Annual Gerald R. Ford Journalism Prize for Distinguished Reporting on the Presidency in 2017 to Philip Rucker and Ashley Parker from The Washington Post. Guy Taylor and Dan Boylan from The Washington Times were recognized with an Honorable Mention for Distinguished Reporting on the Presidency in 2017. Hills also presented the 31st Annual Gerald R. Ford Journalism Prize for Distinguished Reporting on National Defense in 2017 to J.J. Green from WTOP Radio (Washington, D.C.), who was the first radio media recipient of the award. R. Jeffrey Smith, Patrick Malone, Chris Zubak-Skees and Peter Cary from The Center for Public Integrity were recognized with an Honorable Mention for Distinguished Reporting on National Defense in 2017. After the dinner, a special GO BLUE! shout-out from the USS Gerald R. Ford (CVN 78) was shared. The shout-out was shown at the University of Michigan home football game against the United States Air Force Academy on September 16, 2017. A special tribute video entitled “Remembering Betty Ford” was also shared. Mike Ford noted that while the evening celebrated the legacy of his father, President Gerald R. Ford, the legacy of his mother, First Lady Betty Ford was also part of the celebration. Ford noted “it was my mother who held us all together”. Trustee Steve Ford, delivered the Invocation. Sergeant First Class Alvy Powell (Ret.) accompanied by Pianist Dan Campolieta closed the event by singing What I Did for Love, God Bless the U.S.A., What is America to Me, and God Bless America.